Track is a site-specific monumental mural by Arturo Herrera, for the entrance hall of OGR Torino’s North Workshops. The Officine Grandi Riparazioni (OGR) Torino is a majestic 19th century industrial complex in Torino, Italy that will now be a center for art, music, food, and cultural programming. 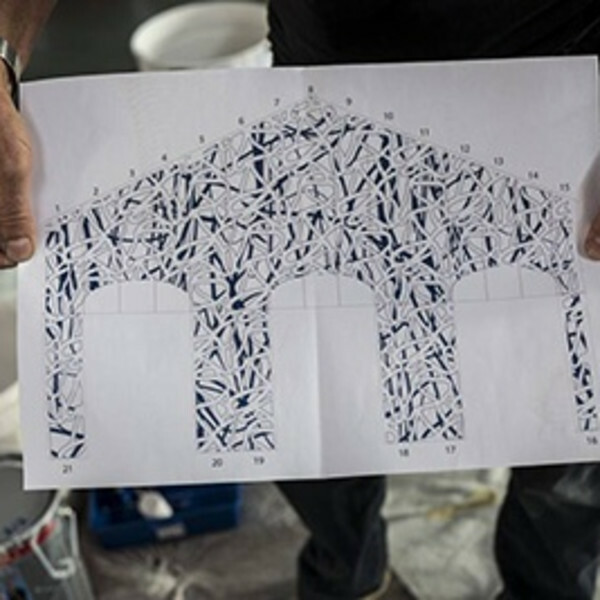 The mural's intricate pattern references the building's use as the site of repair for railroad engines - a series of paths that meet spanning in various directions, suggesting also a twisting of branches and trees that stretch upwards. 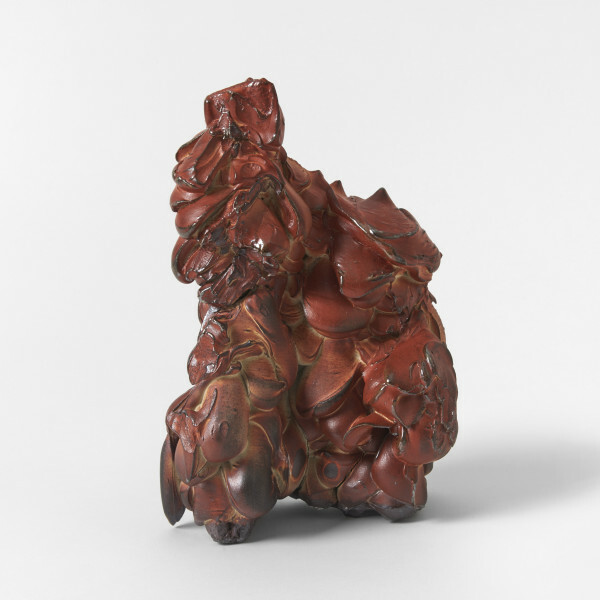 The artwork puts forth the idea of ​​intense movement, suggesting some of the cardinal values ​​of the OGR: interconnection, fluidity and energy. 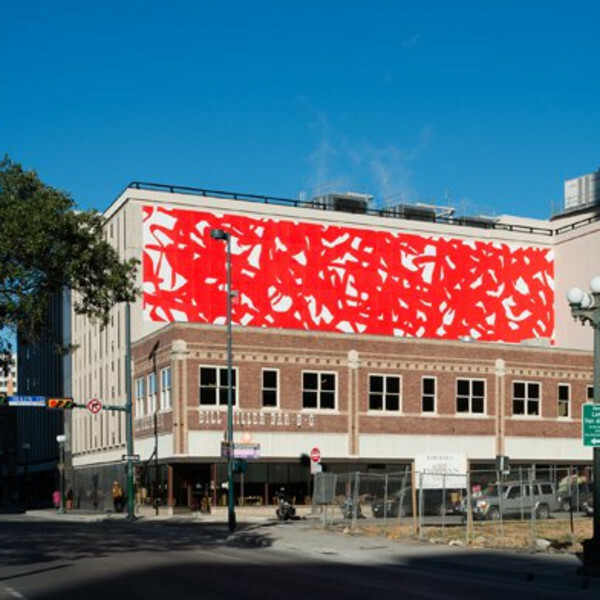 The Linda Pace Foundation is proud to present a public artwork by Arturo Herrera titled Adam, a 2,500-square-foot wall painting located in downtown San Antonio. The dramatic public artwork, which is more than 25 feet high and 98 feet wide, is the largest wall painting produced by the artist in the United States. Adam embraces and fulfills the Linda Pace Foundation's mission for the community to experience contemporary art in nontraditional settings. "This installation advances San Antonio's growing reputation as a cultural center for innovation and creativity," says Maura Reilly, executive director of the Linda Pace Foundation. "We are honored that Arturo tailored this design specifically for us. Having a public art display by an artist of his caliber positions Adam as one of the city's newest attractions. Adam will inspire local residents, tourists, and also bring art aficionados to our city." Herrera scouted San Antonio earlier this year looking for the consummate setting for Adam. He found the ideal spot in Main Plaza, a vibrant cultural hub for musicians, poets, artists, farmers markets and family activities. 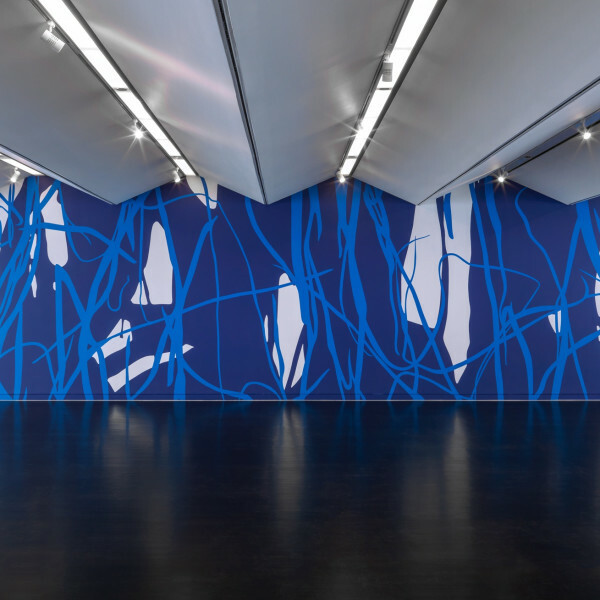 "The inspiration for the wall painting Adam was about movement, the dynamism of abstraction, and a soaring energetic field, like Spring, when everything awakens," Herrera said. "The title Adam brings several images to mind: An earthbound beginning; the first individual human; humankind. It is a powerful and yet open-ended title that can convey multiple readings to the audience. The color red that I chose for Adam was intentional as red is the color associated with heat, power, physical energy and celebration. Coincidently, red was Linda Pace's favorite color, both for its physical and spiritual qualities." The Linda Pace Foundation is funding the project and it will remain prominently displayed on the side of the Frost Bank Parking Garage at the northwest corner of Commerce Street and Main Avenue for three years, through December 2016. Arturo Herrera was born in 1959 in Caracas, Venezuela. He received his BFA from the University of Tulsa in 1982 and his MFA from the University ofIllinois at Chicago in 1992. He lives and works in Berlin. Arturo Herrera has developed a multilayered body of work that includes collages, sculptures, photographs, cut felt pieces and wall works. Herrera uses a fragmented language-whose lingering references range from popular culture to art history-to decontextualize inherent narratives without eradicating the coded referentiality of the image. The resulting works shift in between the explicit and the implicit. A pliability of meaning is played out through the ambiguity of figurative and abstract forms. These forms do not enforce a specific message. Instead, they address the fragmentation and recomposition of mass-culture elements to explore the impact of the adulterated language of abstraction into the collective gaze. The Linda Pace Foundation is committed to the charitable vision of its founder. Guided by the donor's conviction that contemporary art is essential to a dynamic society, the Linda Pace Foundation fosters the creation, presentation, and understanding of innovative expression through contemporary art. Grants support the operation of Artpace, CHRISpark, the public exhibition of Pace's contemporary art collection, and the work of contemporary artists. An enticing glimpse of Arturo Herrera's Night Before Last/Chicago is visible to those entering the u.S. citizenship and Immigration Services (uScIS) building in chicago. 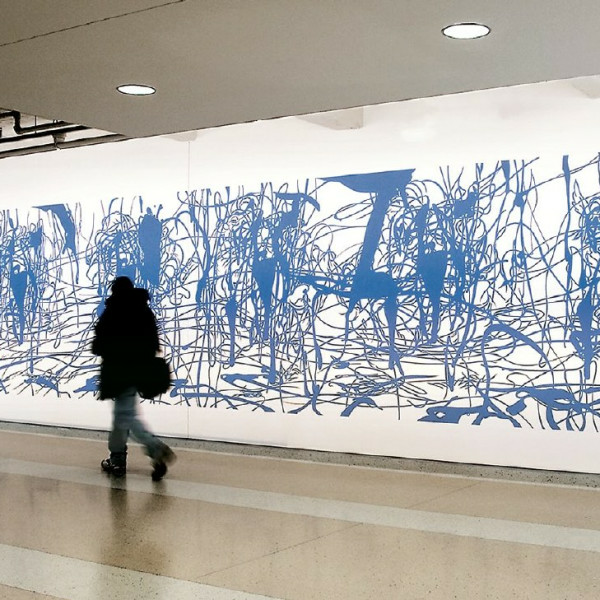 The mural's tangled arabesques tumble out of sight as they proceed toward the atrium, sparking curiosity and conversation from visitors and employees who wish to decipher the artwork's meanings. In some areas, the swirling lines gather into evocative fragments of cartoon figures from the 1 3 disney animated feature film snow White and the seven Dwarfs. In other sections, the paint strokes loosen into vibrant abstractions, reminiscent of Jackson Pollock's famous action paintings. herrera seamlessly blends these two quintessential icons of American culture, along with myriad other references and influences, to create an artwork that resists easy definition and remains open to the unique perspectives and interpretations of individual viewers. As the district headquarters for the uScIS, the building receives visitors from all parts of the world daily. The universally recognizable cartoon imagery of Night Before Last/Chicago starts viewers out along familiar paths, allowing them to identify select forms: Snow white's hair tied with a bow, the bulbous shoes and caps of the seven dwarfs, the handle of a pickax, a candlestick, small tufts of grass, a fluttering bird, and many other details. but the longer one looks at herrera's collaged image, the more one discovers. Soon, new and more personal associations may begin to emerge. Attempts to interpret the mural's intricately layered shapes require creativity, imagination, and a willingness to engage new ideas. Such qualities are needed for any exploration, and are thematically relevant to the many visitors who arrive at the federal building in the midst of their journey toward a new life in a new country. Herrera-who was born in Venezuela-was once on such a journey. Following his university studies in the united States and periods abroad, he returned to chicago to pursue graduate education and eventually acquired u.S. citizenship. reflecting on his own experiences-which included many visits to buildings like this one- Herrera conceived Night Before Last/Chicago as an artwork that speaks to and energizes the broad range of people visiting the uScIS each day.